RB-SYA Analogue Video Sync Board For RB-SC2 (PAL, NTSC, SECAM). the RB-SYA and the RB-SYD. There are four optional video sync boards which can be used to synchronise the outputs of the RB-TGHD(B & X): the RB-SYA, RB-SYD, RB-SYE AND THE RB-SYW. The Digital video sync board will accept 270Mbps SD-SDI and HD-SDI signals covered by SMPTE-259-M-C (SD) and SMPTE-292M (HD). RB-SYD Digital Video Sync Board For RB-SC2 (HD-SDI, SD-SDI). The AES/EBU sync board will accept a digital audio input signal with a sample frequency between 32kHz and 192 kHz. 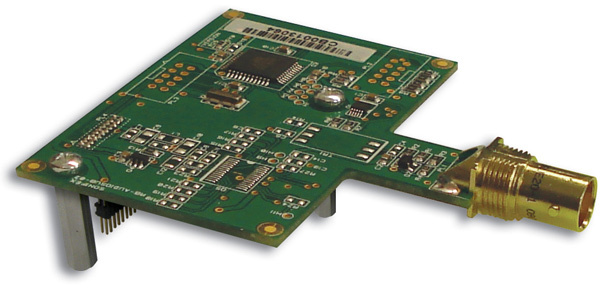 When using the RB-SYE sync board, the Channel Status information that is encoded in the input data signal is copied to all digital output channels on the RB-TGHD. The Audio Clock sync board will accept a distributed clock running at the desired sample frequency between 32 kHz and 192 kHz. Thesignal can be differential or single ended TTL level.